Splashing around in Pumpkin Gingerbread goodness this little wax embed Gingerbread man knows how to have fun. We begin with a layer of Buttery Gingerbread, followed by maple crumbles then we added a layer of our hand whipped wax in Spiced Pumpkin Chutney. We topped the whole thing off with little wax pumpkin embeds and a wax gingerbread man. Soooo cute! 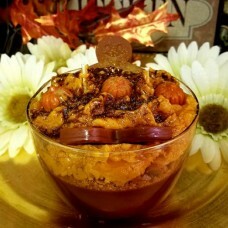 When I think of comfort foods, I think of yummy desserts, that is what inspired this line of delectable candle creations. Each candle is created especially for you, it takes a very long time to pour candles such as these, each Comfort Candle is poured individually so they REALLY are not only candles but works of art. Candles By Victoria Comfort candles come in one size, our wonderful 16 oz. jar. We love this container so much because of the wide mouth, it allows for a larger melt pool, which in turn produces an outstanding scent throw! These candles come double wicked for a perfect burn from the beginning of your candle until the very last drop.